Ph.D. in Orthodontics is a doctorate program that extends up to 3 years in most institutions. The minimum eligibility for admission in this course is a Masters degree in the relevant subject with a minimum of 50% marks or an equivalent in the degree. Admission to the course is based on a candidate’s performance in the entrance tests conducted by the institute followed by a round of personal interview. The Ph.D. in Orthodontics is a popular course choice amongst the students who want to lay emphasis on active clinical experience, didactics, and research. Students are trained to become leaders in academic research aimed at oral sciences. Students are offered theoretical learning combined with clinical experience relevant to the delivery of orthodontic treatment. The average course fee for the doctorate course ranges from INR 50,000 – 2,50,000 annually for a span of 3 years. Candidates holding the doctorate degree get to work as professors, forensics, researchers, dental surgeons, dental hygienists, oral practitioners etc. 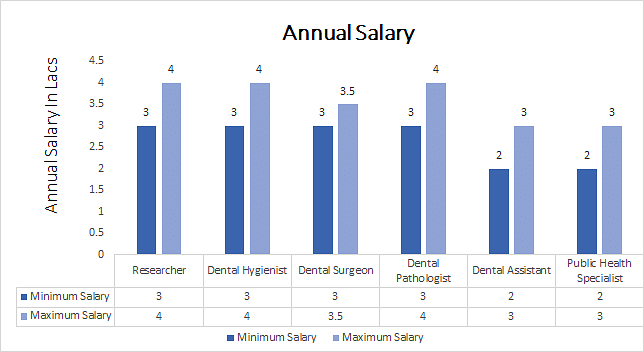 The average annual salary of such a candidate ranges from INR 4,00,000-INR 5,00,000 which increases with further increase in a number of years of experience. Eligibility A Masters Degree in the respective discipline with at least 50% score or an equivalent on the grade scale basis. Job Positions Professors, Forensics, Dental Hygienists, Public Health Specialist, Researcher etc. Ph.D. in Orthodontics: What is it all About? The course has been designed in order to offer balanced education combining foundation of basic sciences with clinical and behavioral training of the Orthodontics field. The course helps immensely in offering clinical experience for successful private practice or academic research career. The program aims to keep the students abreast with the latest researches and technologies of the dental field that can help them in building their acumen. Coursework like Research Methodology comprising of Quantitative Measures and Computer Applications combined with thesis on a given topic lets the student have a deep encounter with the field of Orthodontics. One of the primary goals of this course is to produce efficient and exceptional students that join the academic research arena in the oral health sciences. For the ones seeking clinical experience, enough exposure is provided to the students to gain expertise in the field. Candidate must have passed the Master’s degree in the relevant field with at least 50% marks or an equivalent on the grade scale from a college recognized by the Dental Council of India. Candidates must secure the minimum cutoff marks in the relevant entrance examination. All the institutes and colleges offering Ph.D. in Orthodontics admit students on the basis of their performance in the relevant entrance examination followed by a personal interview or counseling. A minimum percentage of around 50% in the Master’s Degree is also required by the candidate in order to secure admission in the doctorate course. The Master’s Degree should be pursued from a recognized college. KLE University PhD entrance exam. Successful doctorate degree holders either enter into the research area or work in clinics and hospitals. The ones inclined towards academics work as researchers, forensics and professors. Some Ph.D. in Orthodontics doctorates also work in clinics as oral pathologists, public health specialists, private practitioners, dental hygienists, dental surgeons etc. whilst catering to the oral needs at the individual as well as community level. Apart from this, candidates can also continue to research further in the Orthodontics domain.